Backing up your important data will give you peace of mind. There are many strategies and tools to help you, many are fairly easy. Some are not. The backup tool from Microsoft was not very easy, until now. Most users simply didn’t back up. Windows 8 has a goal of effortless backups. To do this, they created File History. It is a fully automated, set and forget archiving tool. The idea is to make it so easy that users would actually do it. "File History is a backup application that continuously protects your personal files stored in Libraries, Desktop, Favorites, and Contacts folders. It periodically (by default every hour) scans the file system for changes and copies changed files to another location. Every time any of your personal files has changed, its copy will be stored on a dedicated, external storage device selected by you. Over time, File History builds a complete history of changes made to any personal file." This will not work with CDs or DVDs, traditional backup media. It is best to have a large capacity external hard drive attached to the computer. I use a Western Digital 1TB External USB Hard Drive . 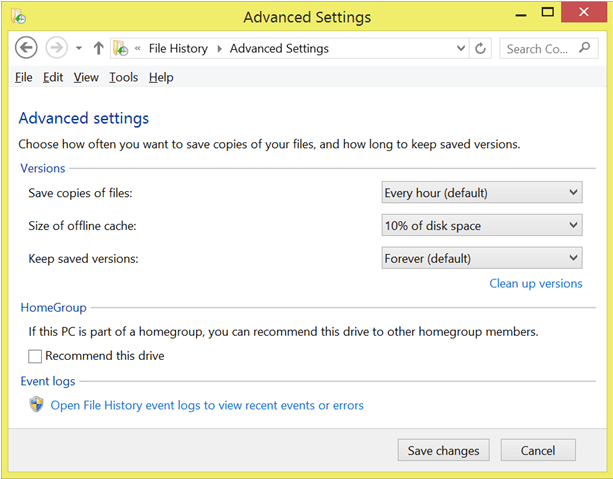 There are several ways to start File History, you can use Search and type File History, or open Control Panel using the +X menu and click System and Security/File History. It will show you the drives available or prompt you to install one. 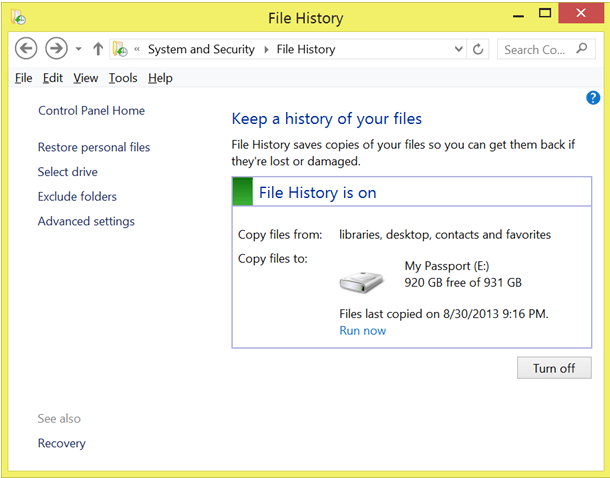 Here is a Win8 Support article, "Set up a drive for File History." Once you’ve selected a compatible drive, click the “Turn on” button at the lower-right corner of the dialog box, and you’re done. It really is that easy to get File History up and running in default mode! If the default settings of backing up your Libraries (My Document, My Pictures etc.,) Desktop, Favorites, and Contacts isn’t enough, you can include any folder by adding the folder to your libraries. Here is the Libraries Tutorial for Windows 7. It works the same in Win8. 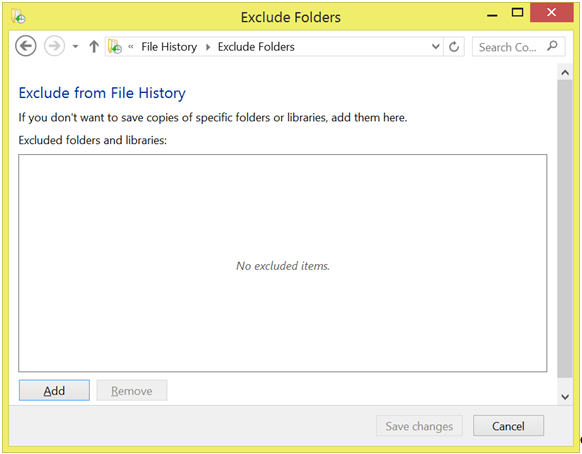 To exclude specific folders from the archive: Click the Exclude folders option below the “Select Drive” and add them in the dialog box. This is where you choose settings for how often the system automatically saves your files. The default is every hour. If the drive is not available, like when I take the Surface Pro away from home, File History will save the files in a temporary offline cache on the local C: drive, which you configure here. You can choose how long to keep saved versions of your files, too. Forever is the default setting. You can remove old backup versions if you need to free up some disk space. A backup is no good unless you can restore your files. It is a good idea to do a test restore on a file to insure you are getting a good backup. The bottom blue arrows let you scroll through backup sets by date and time — older backups to the left, newer ones to the right. 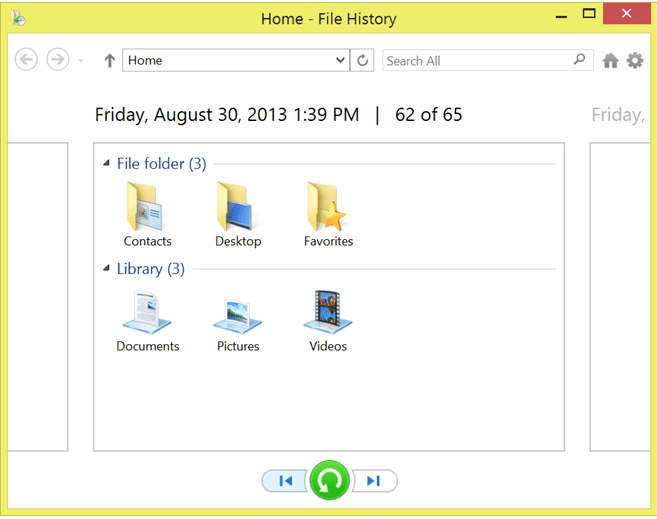 The round green button will restore any file or folder you select. You navigate your backup sets just as you would in File Explorer — select a library or folder to see what is inside. File History will let you preview the contents of any backed-up document. Click the document and it opens, right within the File History applet. When you’ve found and selected the file or folder you wish to restore, click the round green button; File History will then walk you through the process of restoring the selected file or folder to its original location or even a different location. Because File History keeps so many backups, it can be difficult to find the file or version you want. It is usually easier to find the file you need the sooner you realize you need it. Your computer will fail at some time. File History is a great new feature to make it easy to have a backup. If you are already using a different backup strategy, go ahead and continue doing that. If your files are important to you, Backup, Backup, Backup! Published by MrsGeek, in Blog. Tagged with Windows 8, Windows 8 Backup, Windows 8 File History.